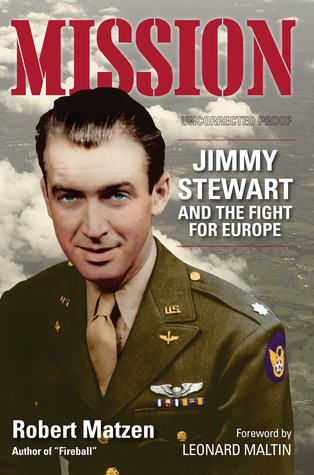 MISSION: JIMMY STEWART AND THE FIGHT FOR EUROPE [GoodKnight Books, October 24, 2016] provides the first in-depth look at the military career of Hollywood actor James M. Stewart, beginning with his family “mission” passed on from his grandfather (a Civil War hero) and father (who served in World War I) that military service in time of war was mandatory for the Stewarts. Jim tailored his life to this eventual outcome, learning to be a pilot so he could serve as an aviator in the war. MISSION describes Stewart’s childhood, college years at Princeton, Broadway career, and meteoric rise to Academy Award-winning actor in Hollywood. People today can’t imagine that Stewart was a ladies’ man, but he had a reputation as one of the most active bachelors in Hollywood, with a list of lovers that includes the A-list of female movie stars. In 1941, before America entered World War II, Jim was drafted into the Army and gleefully left Hollywood behind to fulfill that family mission. What happened to him in the service has never been covered in detail because he refused to talk about his experiences afterward. MISSION begins and ends with production of the first film Stewart made after returning from the war: It's a Wonderful Life, which in December 2016 will celebrate its 70th anniversary. MISSION also includes the stories of three other supporting characters, a radio man who flew with Stewart, a German civilian girl, and the German general in charge of fighter aircraft. They provide perspective on what Stewart was attempting to do and why.